You may notice a change in the look and navigation of your document libraries and lists. This new experience is faster, has additional phone and tablet features, and simpler navigation. 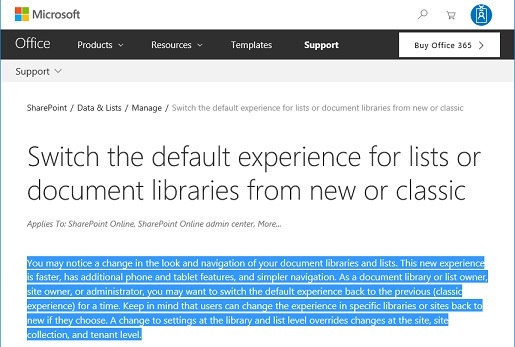 As a document library or list owner, site owner, or administrator, you may want to switch the default experience back to the previous (classic experience) for a time. Keep in mind that users can change the experience in specific libraries or sites back to new if they choose. A change to settings at the library and list level overrides changes at the site, site collection, and tenant level.